Author(s) Margaret M. Andrews PhD RN CTN-A FAAN Andrews, Margaret M. Boyle, Joyceen S.
Transcultural Concepts in Nursing Care helps nursing students transform their thinking so they develop into culturally competent nurses capable of safe, thoughtful, and ethical care of individuals, families, groups, and communities of diverse backgrounds. 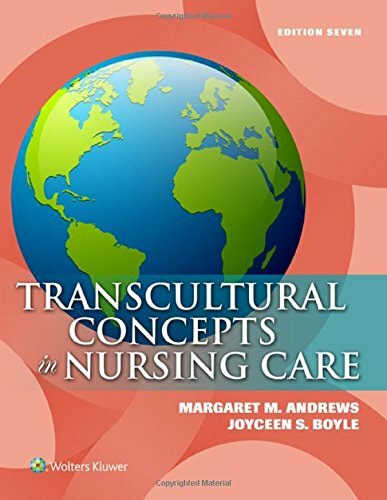 Transcultural Concepts in Nursing Care takes a life span approach to describe cultural variations in lifestyle, habits, beliefs, and life process. and in doing so, provides a framework that will improve health and nursing care to minority, underrepresented, disenfranchised, and marginalized populations. Rather than just covering specific cultures and expected behaviors/beliefs of that culture, the authors provide students the tools they will need as nurses to effectively perform cultural assessments and incorporate their findings into their interventions. With more culture specific examples in this edition, the text offers the knowledge needed to provide culturally competent and contextually meaningful care for all clients. Fully updated in its seventh edition, this unique resource creates an interdisciplinary knowledge foundation reflecting the cultural changes in the clinical nursing environment.